Ahmed is one of "the guys," Iraqi refugees portrayed in ElShelleh. Heather McEntire is a queer southern musician in Whistlin' Dixie. The trail of sand in Paved with Good Intentions ends up in concrete. The unique ladies of the Unique Ladies car club in San Diego. Gaynor Siataga on the streets in a scene from Fa’aSamoa. 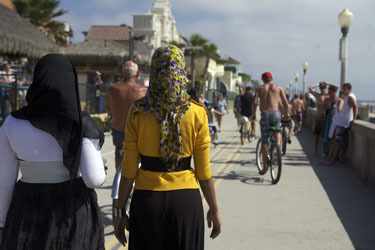 Somali orphans Maryam and Roda walk the esplanade in San Diego. This is the fifth annual Soc Doc Graduate Exhibition and the second to be showcased at the Del Mar Theater. This year the screening moves to the large downstairs theater after last year's full house resulted in many attendees being turned away. "The work you will see, hear, and experience is the culmination of an intense two years as our students immersed themselves in documentary traditions and craft, scholarly research and analysis, and storytelling," said Renee Tajima-Peña, professor and graduate director of the Social Documentation program. Tajima-Peña also announced that beginning next fall, the masters program will join the Film and Digital Media department in the Arts Division. It has been part of the Community Studies department in the Social Sciences division since it was founded in 2005. The exhibition this year features six video documentaries. In addition, one student, Bridgette Auger, has a photography exhibition at the Michaelangelo Gallery, 1111-A River St., Santa Cruz, June 3 – 26, with an opening reception on Friday, June 3. In her photo-based video documentary, Auger follows four Iraqi refugees, all friends, as they search for direction and purpose in their new home in El Cajon. Photographs, voices, and music reveal the personal histories and current struggles of Ahmed, Jack, Tommy and Fadi. When not working in dead-end jobs, the guys get together to cook, play music, and sustain each other as they try their best to find a way to move forward in a country that regards them with suspicion, fear, pity, and resentment. 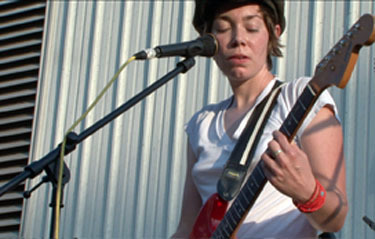 Meredith Heil takes a road trip to the South in search of musicians like the Butchies, Midtown Dickens, Street Poet, Humble Tripe, Amy Ray and Melissa York -- members of a new generation of queer activists who spend their nights creating independent music, promoting acceptance, and celebrating queer visibility amid confederate flags and pop country radio. Along the way, she investigates the complex historical relationship between Southern music, identity politics, and resistance. 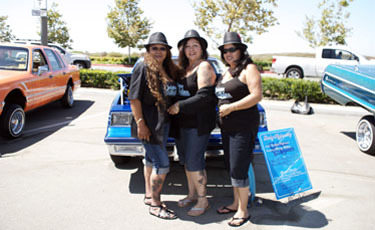 Gloria Morán focuses on an all-women’s lowrider car club in San Diego. Despite a constant struggle to keep their club alive, Sherry Yafuso and Pat Guitierrez manage to make it to their fifth year. Now the ladies are ready to expand. Only the summer’s final car show can prove whether these women can handle the driver’s seat. 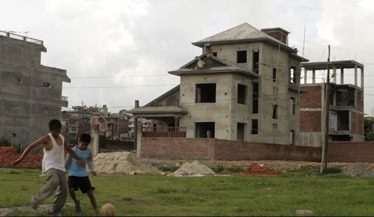 follows the sand from illegal mining in the Bagmati River Basin to its transformation into cement for the construction of middle-class housing developments in Pepsi-Cola Town Planning. Along the way she finds a complex and conflicted relationship between eco-development, tourism and the rights of the landless and refugee sand-miners living along the river. In her personal documentary, Ursula Siataga examines the notion of Fa’aSamoa (the Samoan Way of Life) as it is contested, forgotten, and remembered in the lives of her boisterous multi-generational family. Siataga’s grandparents arrived in San Francisco during the great wave of migration in the 1950s. The film is a "memoryscape" prompted by her grandmother’s last days. It focuses on the tension with a new generation, changing times, and the troubled history of Siataga’s sister Gaynor, whose life has been torn between Fa’aSamoa and the streets. Kate Trumbull follows best friends Maryam and Roda who grew up in San Diego after being orphaned and displaced by civil war in Somalia. Caught in a cultural tug-of-war and bonded by the loss of their parents, they are on the verge of adulthood when unexpected news of eviction, only two weeks before Ramadan, shocks them and tests the bonds of their friendship. As they decide to move to a new city, old memories of war and loss reappear along with the threat of separation. The Social Documentation Program at UC Santa Cruz is an innovative, two-year graduate-level program leading to a Master of Arts degree. It provides students with a chance to develop expertise in various documentary media, including film and video, audio, photography, and digital media. Soc Doc taps faculty from throughout the UCSC campus to provide students with access to expertise across traditional disciplines. Soc Doc graduates have earned grants and awards for their thesis documentaries in film/video, photography, and digital media. More information is available on the Social Documentation Program at socdoc@ucsc.edu or 831-459-4706. The graduate exhibition is supported in part by the Social Sciences Office of the Dean, City of Santa Cruz Redevelopment Agency, Nickelodeon Theaters, Inc., and Michaelangelo Gallery.